Living… in London and Los Angeles, but currently traveling the North English countryside for a tour of his native country’s cuisine. 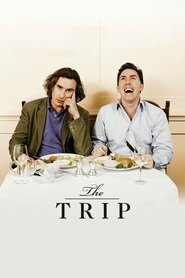 Along for the ride is his buddy Rob Brydon, a Welsh actor and talk show host. Together, they bounce from town to town, hotel to hotel, with Steve hoping for another meaningless one-night stand. Interests… words. Steve has a seemingly encyclopedic knowledge of Romantic poetry – freely quoting from Keats and Shelley and pulling insights from their biographies. He’s a cinephile, a lover of theatre, and an arts aficionado. Like Rob, he also is a talented impressionist, always looking for a chance to perfect his Michael Caine, Sean Connery, or Woody Allen impressions. Relationship Status… in a relationship, though you wouldn’t know it by watching him. His girlfriend Mischa is conspicuously absent on the trip, though she’s a foodie herself. Steve’s instead taken to trying to hook up with any available woman that crosses his path, without letting Mischa know. Steve is ambivalent about stability, feeling like he is emotionally incapable of handling the very thing he wants – the love and support of a long-term relationship. At least, that’s what he says he wants. Challenge… finding a way to actually enjoy himself. Steve isn’t that excited about having Rob along with him, admitting that he only invited him because everyone else he asked was busy: “I’m with a short Welsh man who does impressions; it’s not fun.” But in a way he also envies Rob’s contentment with his career, his family life, and this very trip. Steve is always worrying, always wanting more. Personality… cynical, smart, and hilarious. Steve is always ready to rain on Rob’s parade, or to extend a comic riff for as long as possible. He loves to mess with Rob about Steve’s bigger celebrity status, all the while complaining that it isn’t big enough. He sees the vapidity and stupidity of it all, and yet he still can’t stop from caring. He is open about his need for acceptance and love, yet he still indulges in one-night stands. He is someone who understands his flaws yet seemingly can’t be bothered to fix them. Then again, they’ve brought him this far, haven’t they? Steve Coogan's popularity ranking on CharacTour is #4909 out of 5,000+ characters. See our top-ranked characters and read their profiles.